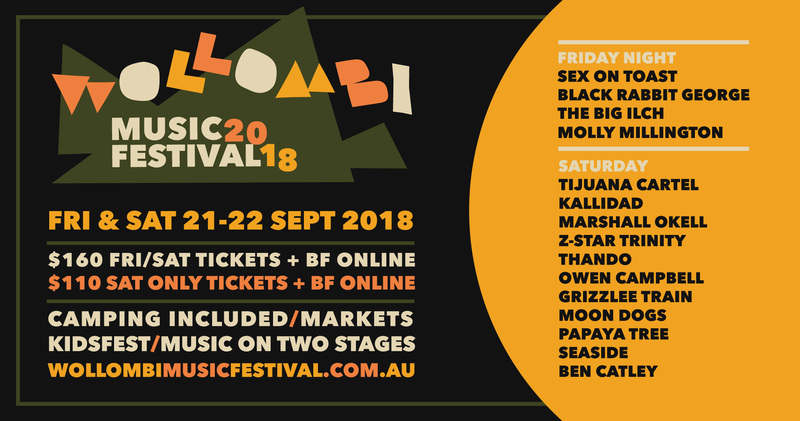 WOLLOMBI MUSIC FESTIVAL FRIDAY & SATURDAY SEPTEMBER 21 & 22 2018 Wollombi Music Festival returns for an expanded 9th year on Friday & Saturday September 21 & 22 2018 at the beautiful 'Cranky Rock' site, just a 5 minute drive from the historic village of Wollombi. All tickets now include camping & are priced at $160 + BF for Friday & Saturday night or $110 + BF for Saturday only. The Friday night will be a limited ticket affair with gates opening at 3pm & live music on our Big Yengo stage from 6 till 11:00pm then a campfire jam around one of our legendary firepits. There will be a sweet mix of food stalls catering for all tastes including vegetarian & vegan, market stalls & our well stocked bar. The Saturday will see the festival in full swing with 2 stages filled with an eclectic mix of artists, quality market stalls, great food & drinks at reasonable prices, a designated 'Mini Wollombi' Kidsfest area, our epic drum circle, Silent Disco & roving performers. 'Cranky Rock' is nestled in a scenic valley & provides perfect adjacent & flat camping areas for both tent & van campers. Wollombi is colorful, friendly, a coming together of music & community but most of all it's a GREAT party! Located 5 minutes outside the historic village of Wollombi, just 1.5 hrs from Sydney, 1 hr from Newcastle & the Central Coast. N.B. Wollombi is a NO BYO alcohol event. Bags will be checked upon arrival by our friendly security staff. Food may be brought into camping areas but no cooking outside of enclosed spaces. Fires are strictly prohibited due to RFS guidelines. Tickets in 2018 are limited to 1000 & the tent camping area is a no vehicle area. All tent camping is 'drop & park' with the parking area directly adjacent & a short walk. There is large van & caravan area. Tickets are transferable person to person but there are no refunds on purchase unless the festival is cancelled due to a 'force majeure'. Booking fee is per ticket. © 2019 Ticketbooth on behalf of Adrian Buckley Management. All sales are final. Tickets are non-refundable.